Mobile has fast emerged as the primary platform for media consumption. However, as advertisers try to figure out how to best use mobile advertising to effectively reach their target audiences there is some hesitation around allocating budgets for mobile ad campaigns. Without context on how consumers are spending their time in the mobile environment, advertisers are left in the dark as to the best strategies to plan and execute these campaigns. We recently released the U.S. Mobile App Report which highlighted the many ways in which Americans are engaging with mobile media today. Understanding the who, what, where, when and why of mobile app activity can help shed some new light on this growing medium that can help mobile advertisers become smarter about their campaigns. Millennials (18-34 year olds) are a hot target for advertisers and they also tend to be heavier than average digital media users. So while every age segment is highly engaged with mobile apps, it’s perhaps not surprising that 18-34 year-olds far outpace the average. Specifically, 25-34 year olds are the heaviest mobile apps users with nearly 75 hours of mobile app usage per month. 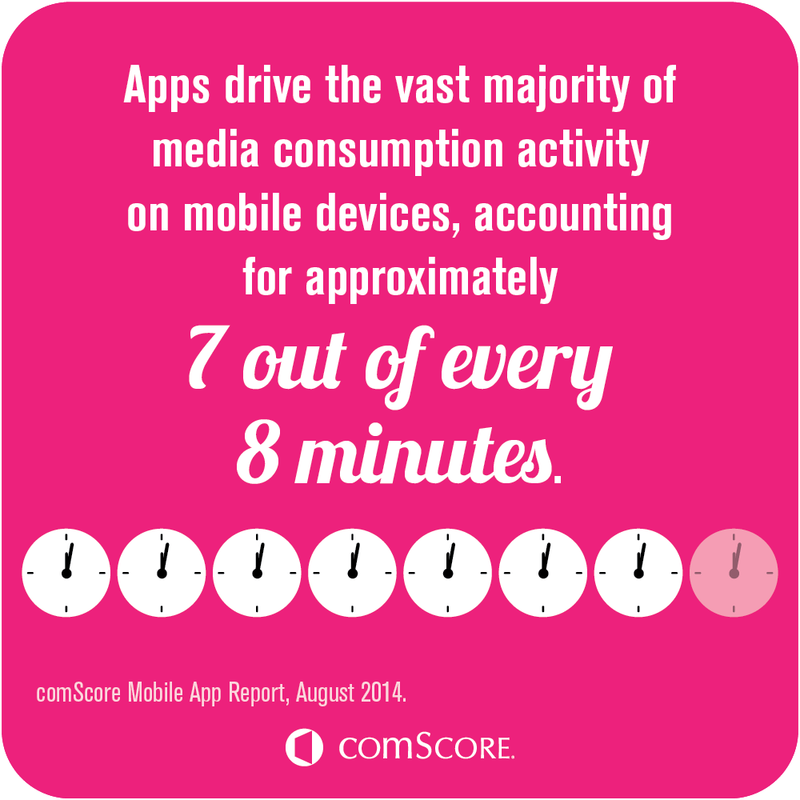 Following closely behind are 18-24 year olds who are spending more than 73 hours per month in mobile apps. By comparison, 35-54 year olds spend 64 hours per month in apps, while 55+ year olds spend just shy of 50 hours per month. The ranking of top apps is dominated by some of the largest digital media brands – Facebook, Google, Apple, Yahoo, Amazon and eBay. These brands account for nine of the top 10 most used apps, 16 of the top 25 and 24 of the top 50. Facebook is the number one app in both audience size and share of time spent across all age groups, while Pandora Radio ranks as the second most used app for all age segments between 18-54 years old. With these kinds of apps, it’s easier to go in and out of them at an individual’s own convenience which allows people to multi-task and use them throughout the day – either waiting in line, on their way to work, etc. Total U.S. digital media time spent grew 24 percent in the past year, driven primarily by the surge in mobile content consumption. Surprisingly, desktop now accounts for just 40 percent of digital media engagement, while mobile represents a solid majority at 60 percent. Even more noteworthy is that 52 percent of all digital media engagement, and about 7 out of every 8 on minutes on mobile, are driven specifically by mobile app usage. Not only is most mobile time being spent in apps, but almost half of all app consumption occurs with an individual user’s single most-used app. And, most of the time spent in apps is incremental to traditional web usage – meaning that even though more people are spending time in apps, it’s for shorter spurts of time which makes grabbing consumers’ respective attention right away even more critical for advertisers. The smartphone has become the on-the-go consumer’s personal assistant that travels everywhere they go and helps with anything they may need. Demonstrated by the vast majority of consumers using apps on their smartphones and tablets nearly every day, Americans have a difficult time living without their mobile devices. In fact, more than half of smartphone users (57 percent) access apps every single day of the month, while almost 80 percent of smartphone users access apps at least 26 days per month. Across all age groups, the greatest amount of time spent in apps is in leisure-oriented content categories, such as social media, entertainment and messaging. In particular, the Social Networking, Games and Radio categories contribute to nearly half of the total time spent on mobile apps. The younger the age groups, the higher the concentration of leisure-oriented activity. In contrast, older age segments also allocate their time to more functional apps, such as in the Mail and Maps categories, in addition to the Games category. Overall, knowing more about target audiences and the behaviors that make up that audience offers the opportunity for advertisers to conduct successful digital ad campaigns, reaching individuals where they are spending their time. 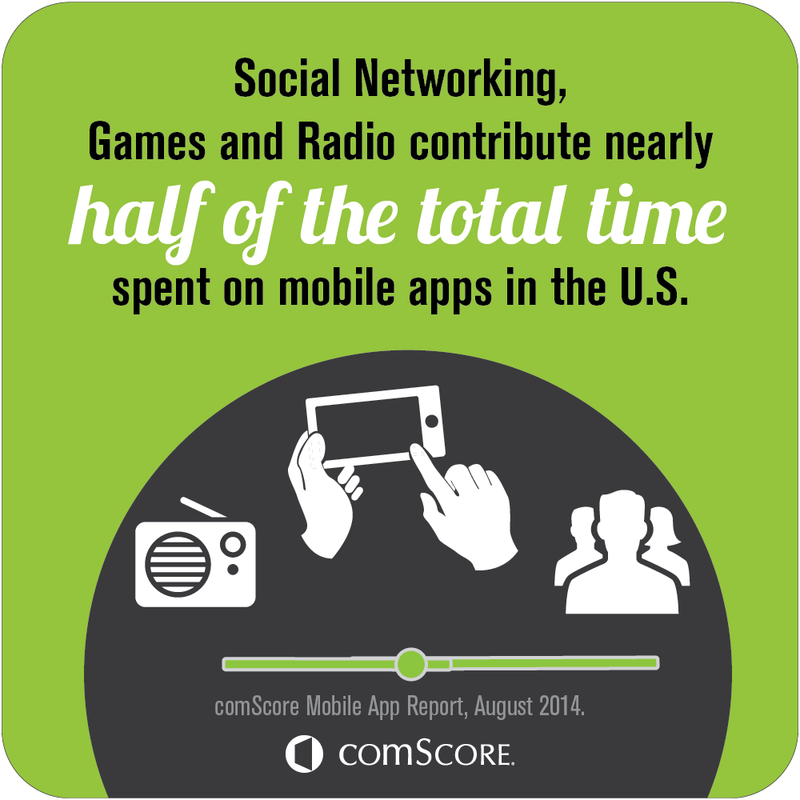 For more insights on how mobile can help you better target your audience, download the U.S. 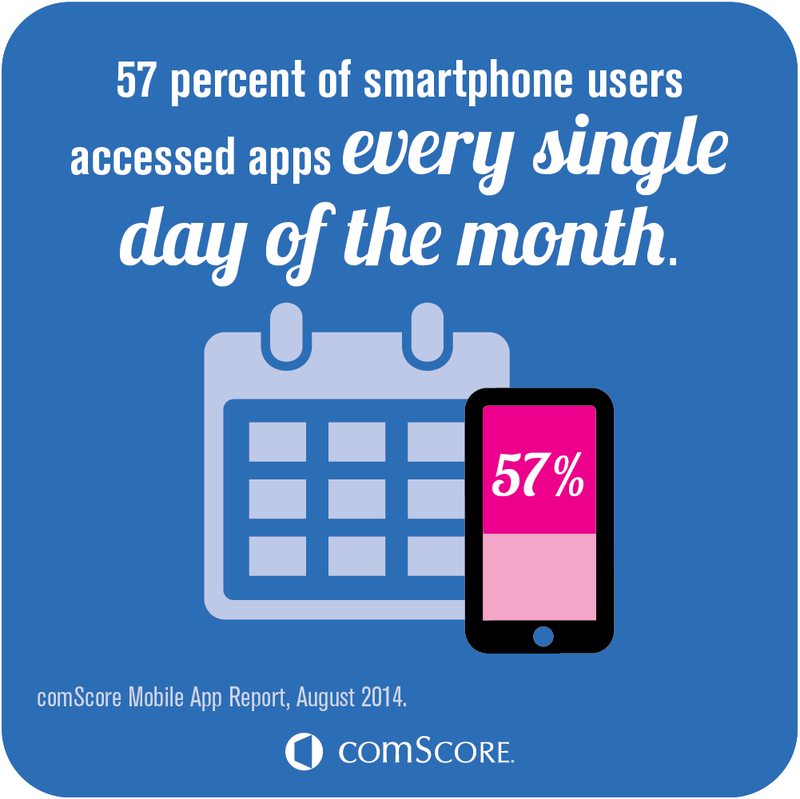 Mobile App Report.